This is normal, dead bees in front, brown snow from cleansing flights. It is not nosema or the hive dying. John checked his colony today, this is what he saw. I did look into the hive this weekend. Large (about 5 frames wide) ball of bees and still 4 or 5 frames of capped honey in the top deep. Didn’t intrude more. No condensation or frost on top. The sponges I have on top to absorb moisture are dead dry. I slid up the metal mouse guard at the bottom entrance and started to scrape out dead bees away from the hive opening. There were lots of active live bees being pulled out as well so I quit. 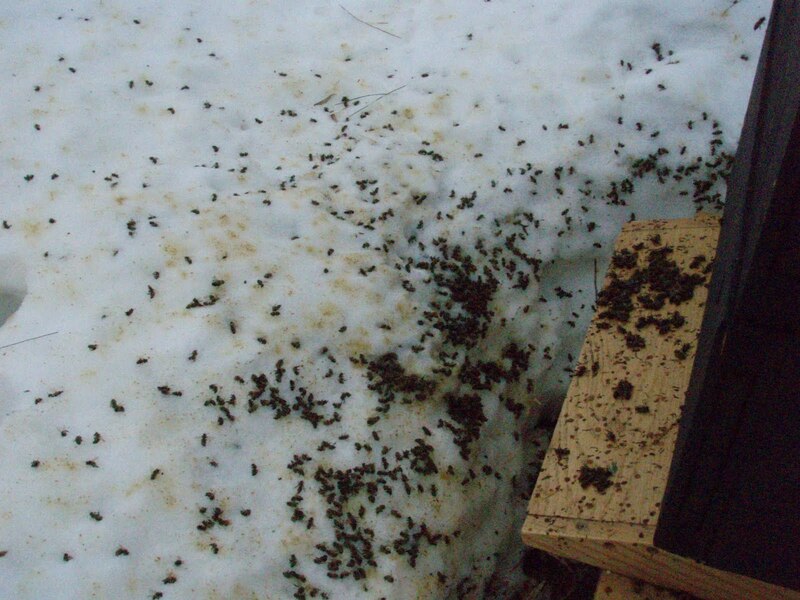 There were some bees flying and lots of evidence of “cleansing flights” ( I love that euphemism…) on the snow. See the pictures attached. I figure that on days like today (Sunday) if I have bees at the hive bottom entrance and at the top in a ball then they have pretty general access to whatever food is in the hive when temperatures allow. 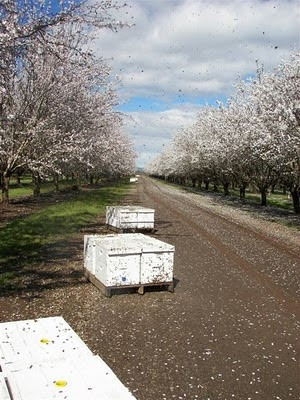 The US beekeeping industry will welcome a versatile new product to the varroa mite control tool box. Mite Away Quick Strips™ (MAQS™) was officially federally registered by EPA in the United States as of February 4, 2011, obtaining the Section 3 registration. 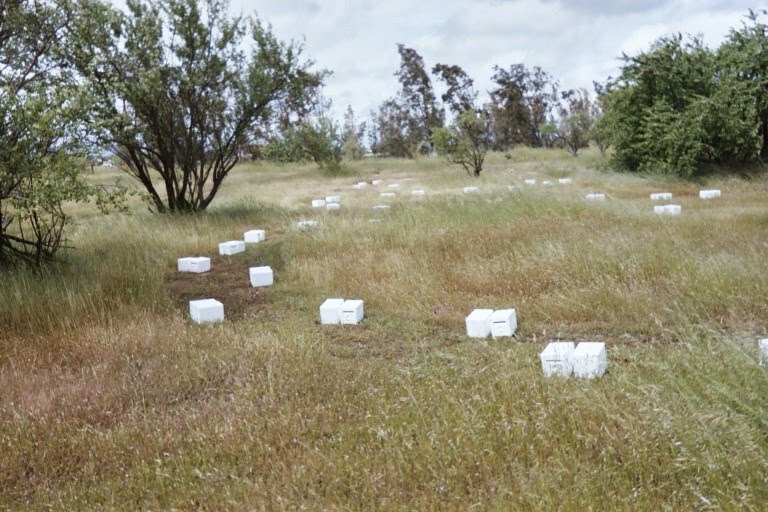 The product will be gradually available over the next few months as production ramps up and pesticide registrations are obtained in each state. MAQS™ is a formic acid gel strip product. Two strips are placed on the top bars in the brood area of the hive. The treatment period is seven days and can be used during the honey flow at temperatures up to 93 degrees F. No extra equipment is required. MAQS™ achieves up to 95% mite kill and penetrates the capping to destroy the male mite and immature female mites as well as the phoretic female mites on the adult bees. A beekeeper sent me these pictures in hopes of trying to figure out what did this. 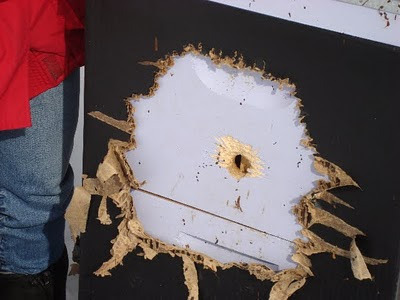 I thought a bear at first because of the elevation of the damage. Then looking at the claw marks they seemed small. I am open for a CSI observation. There were no observable foot prints and a rock was knocked of the top of the lid. Many varmints are in hibernation mode right now so it is hard to put a finger on it. Could it be a Woodpecker? I think a bee would be a tasty treat. I have been e-mailed a suggestion that it is a Red squirrel tearing off the cardboard cover for nesting material. Is this a common picture across the state of MN? An e-mail sent to me. Nearly all of frames in the bottom box and some of the frames in the top box had capped and uncapped honey on them. Where the honey had been removed from the frames, there were bees face first in the comb....looking for honey? One frame had capped brood on it but it had a funny odor.....I don't remember what the AFB frame smelled like from the beekeeping class but that was my first thought. The rest of the frames did not have that odor. Were the larvae "rotting" as the weather warmed....and not AFB? A little more background: when I extracted the honey last fall, the deeps were nearly full of brood and two frames ....outside frames....were solid capped honey on one side only. The capped and uncapped honey in the hive now came from the goldenrod and aster during the wonderful fall weather. 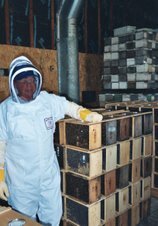 I did NOT treat for mites or Nosema by choice because, at the time I harvested the honey, I would have bet the hive would not have time to collect and store enough honey....and there was no place for them to put honey replacement if I had fed them. The bees could not get to the honey in the hive....prolonged cold spell? What to do with that frame in question? I was at the meeting on Tuesday and I think someone said they would bring in a frame with AFB. If it is AFB, is removing the one frame going to be enough? What to do with the honey that remains in the hive? Leave it there and let the package bees deal with it? Try to extract it? I did remove the moisture board, put the outer cover on straight and cork the top hole so no critters can get into the hive. Most likely your bees starved to death. The cold weather last week and having brood in the colony added up to a colony killer scenario. The bees won’t leave the brood. When the honey was depleted around the brood it was too cold for the cluster to reach out to more frames of honey. This scenario will be common across Minnesota this year. This is why beekeepers need to check their colonies now while there is still time to order replacement bees. The way the honey was distributed in the colony, you said that the lower box was full of honey? If the bottom box was full of honey it should have been on top of the colony. 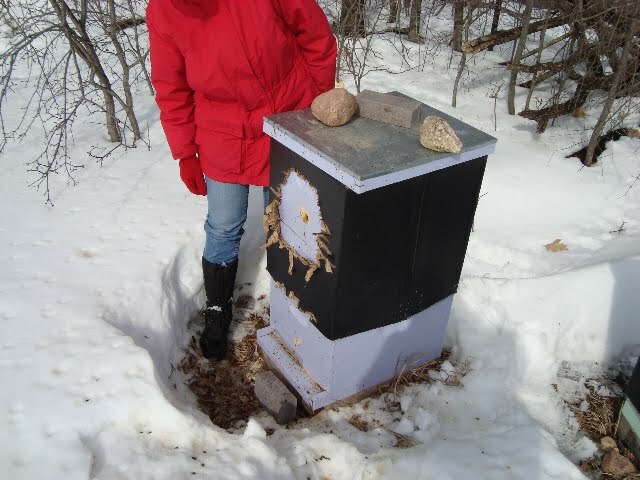 Bees move up in the winter and never move down. They can starve with 90 lbs of honey right under the cluster. As far as the AFB, you need to check the frame of brood for AFB symptoms. Capped brood have perforated cappings? Discolored brood? Larvae the color of milk chocolate? Puncture test, does the larvae rope out over an inch? It more than likely will not be foulbrood, more likely an odor of a dead colony. If it is not AFB, clean up the loose dead bees, clean off the bottom board. Seal up the hive so it doesn’t get robbed out. If it is not AFB using the honey for a new package of bees should be fine. I hope this does not make it into the U.S. I was out driving this morning and saw my first sign of spring. The willow tree branches have turned yellow. They are very noticeable against the cloudy bleak landscape of early Feb. I did some work outside today and heard the spring Fee-Bee call of the Black Capped Chickadee. The weather is going to turn south this week. Cold weather is going to blast us again. Not much we can do about it at the moment. Crossing our fingers and hopefully the bees are on a good frame of honey to make it through the cold snap.